A big chunk of the praise for Agent Carter rightfully goes to star Hayley Atwell, but this new video from Marvel celebrates the less-sung heroes of the show: the visual effects department. Since it centers on a spy and not a hero with crazy powers, Agent Carter might not immediately strike fans as an effects-heavy show. 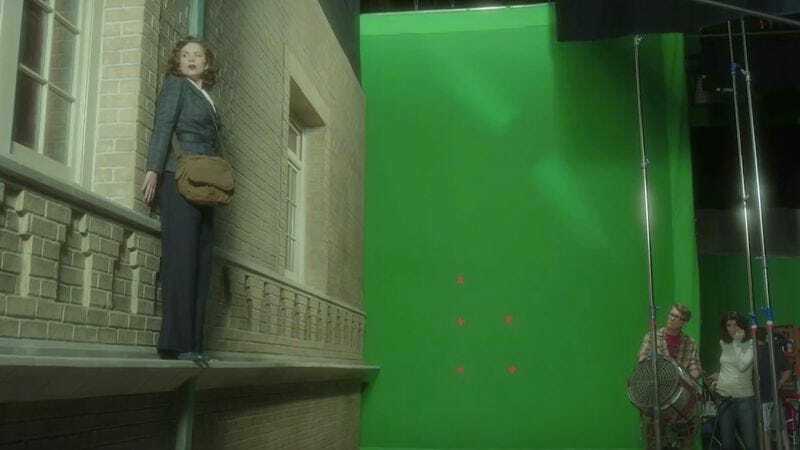 And while it’s true that Agent Carter’s visual effects team doesn’t have to create superspeed or ice breath, the show actually relies quite heavily on subtle visual effects work to create its 1940s setting. This 12-minute video demonstrates the combination of green screen and visual manipulation that went into creating the first season’s New York period setting, earning the show a nomination at the 14th Annual VES (Visual Effects Society) Awards. Of course the video also highlights the more obvious special effects, too, like massive explosions and advanced comic-book technology. But with those shots it’s almost more impressive to see how many of the effects were at least partially done in-camera—like the glowing technology that actually glowed on set.